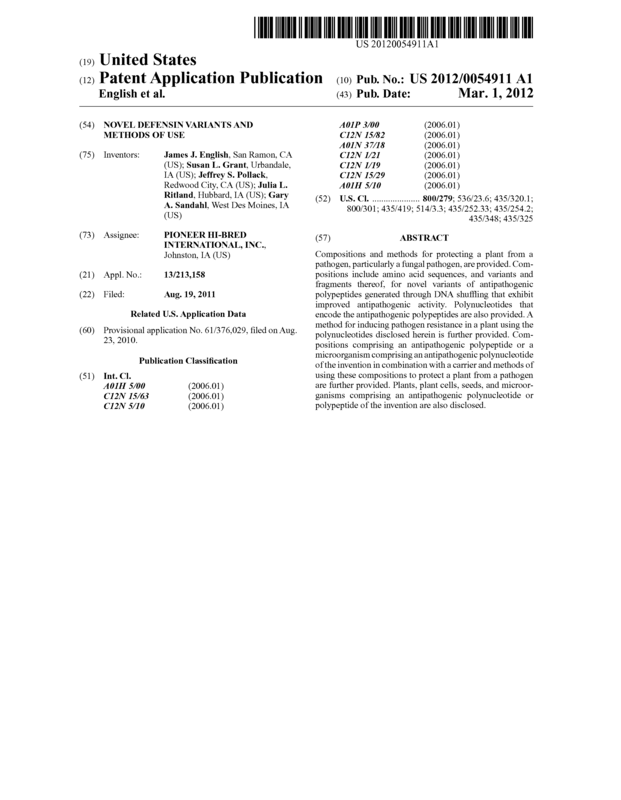 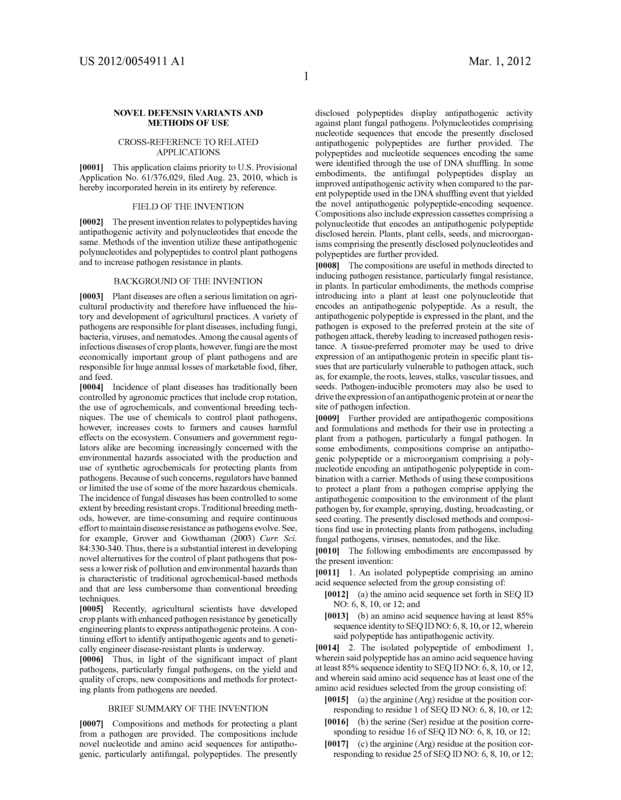 Compositions and methods for protecting a plant from a pathogen, particularly a fungal pathogen, are provided. 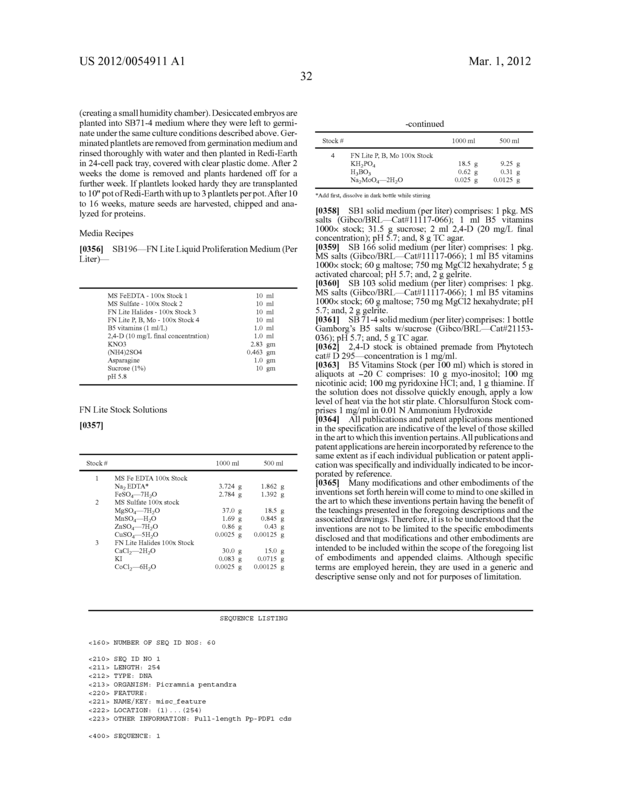 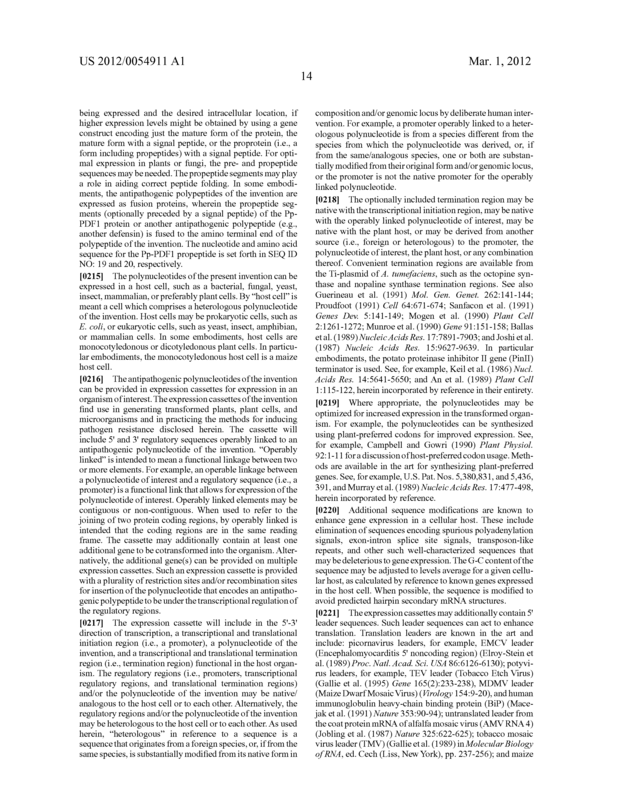 Compositions include amino acid sequences, and variants and fragments thereof, for novel variants of antipathogenic polypeptides generated through DNA shuffling that exhibit improved antipathogenic activity. 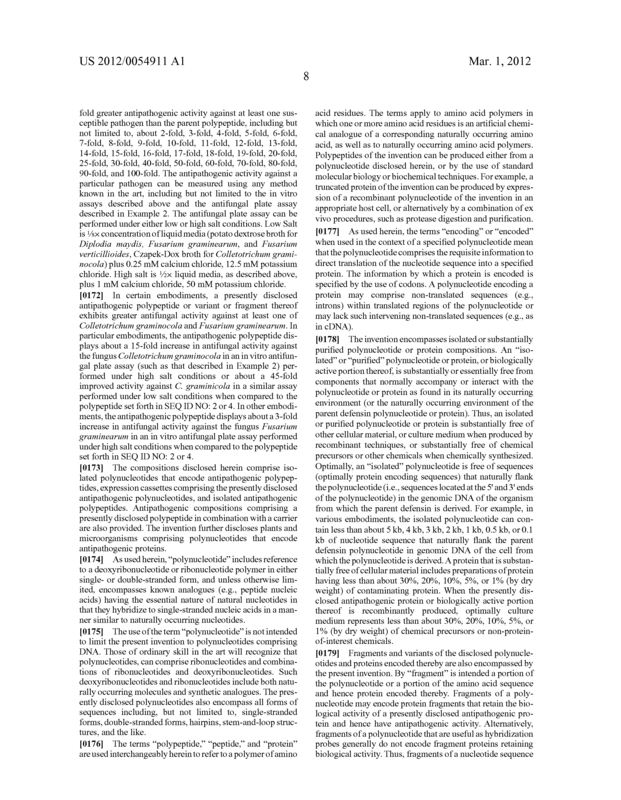 Polynucleotides that encode the antipathogenic polypeptides are also provided. 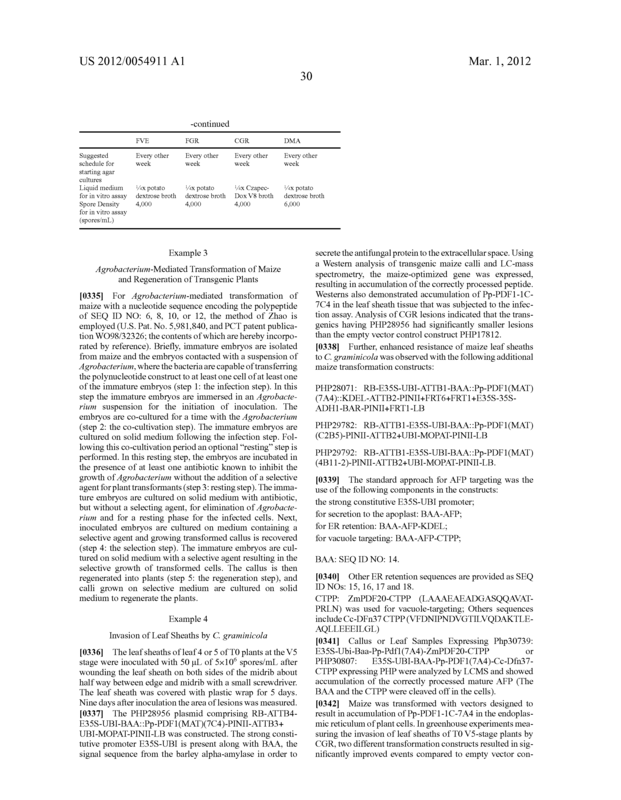 A method for inducing pathogen resistance in a plant using the polynucleotides disclosed herein is further provided. 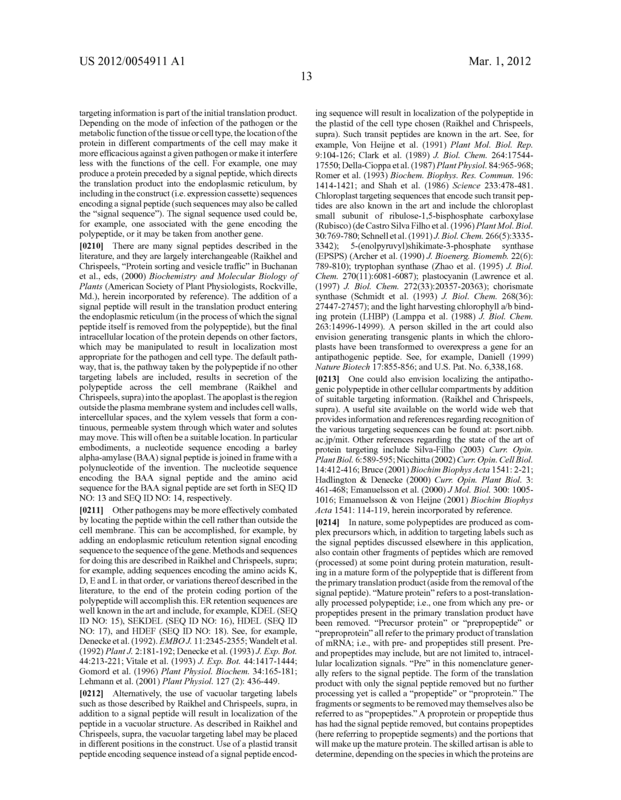 Compositions comprising an antipathogenic polypeptide or a microorganism comprising an antipathogenic polynucleotide of the invention in combination with a carrier and methods of using these compositions to protect a plant from a pathogen are further provided. 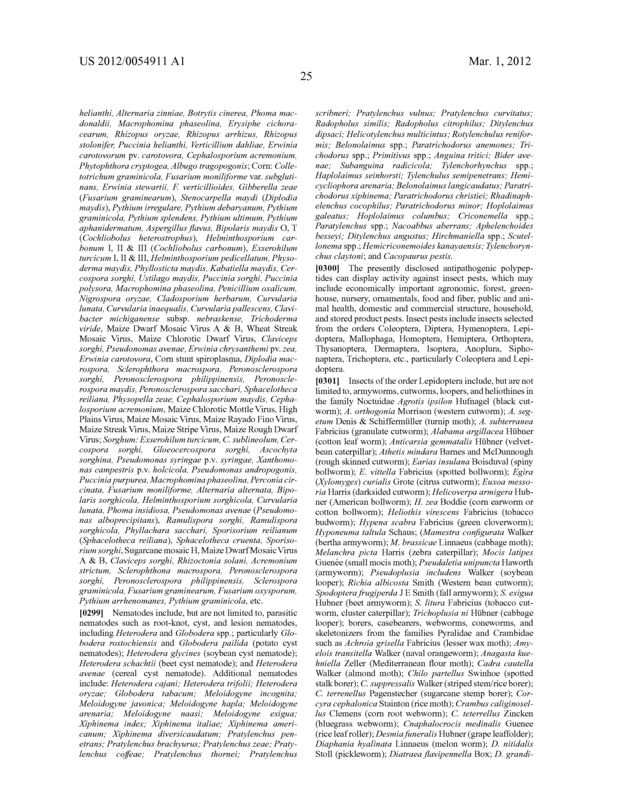 Plants, plant cells, seeds, and microorganisms comprising an antipathogenic polynucleotide or polypeptide of the invention are also disclosed. 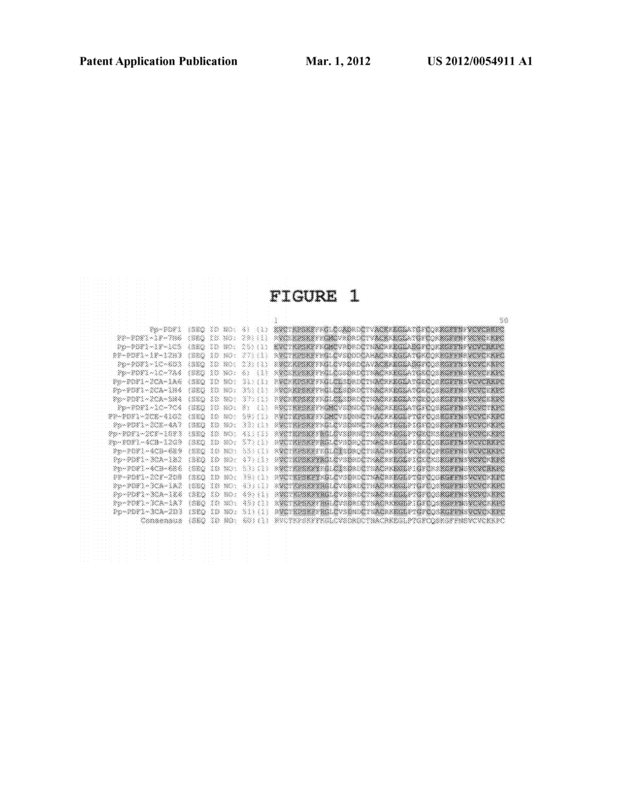 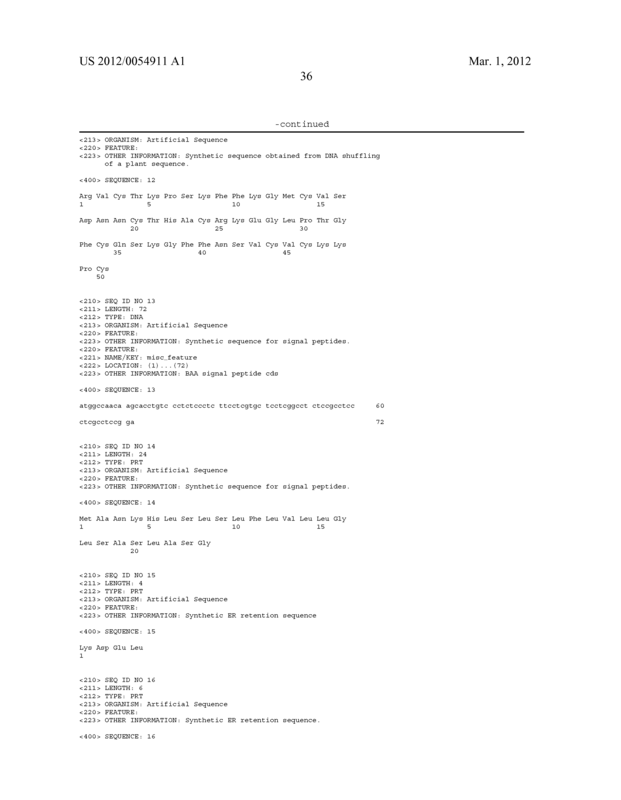 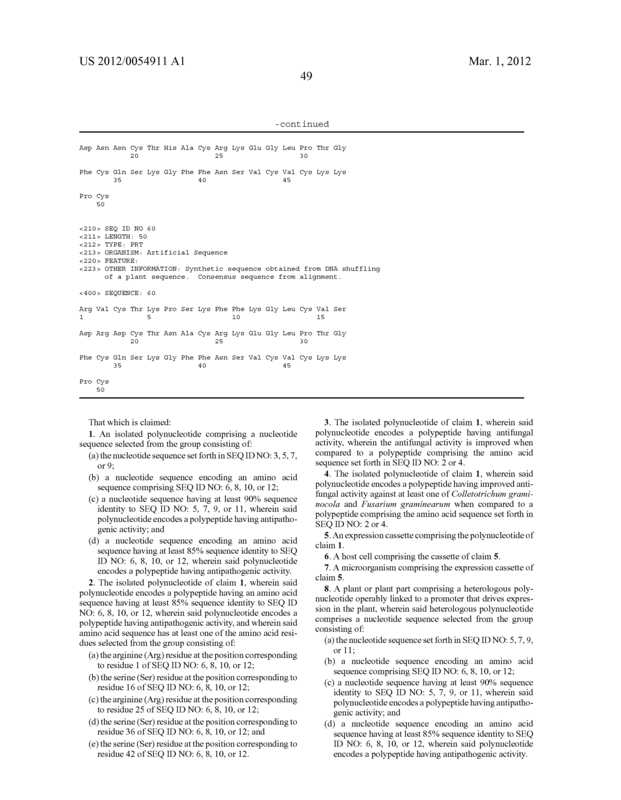 (d) a nucleotide sequence encoding an amino acid sequence having at least 85% sequence identity to SEQ ID NO: 6, 8, 10, or 12, wherein said polynucleotide encodes a polypeptide having antipathogenic activity. 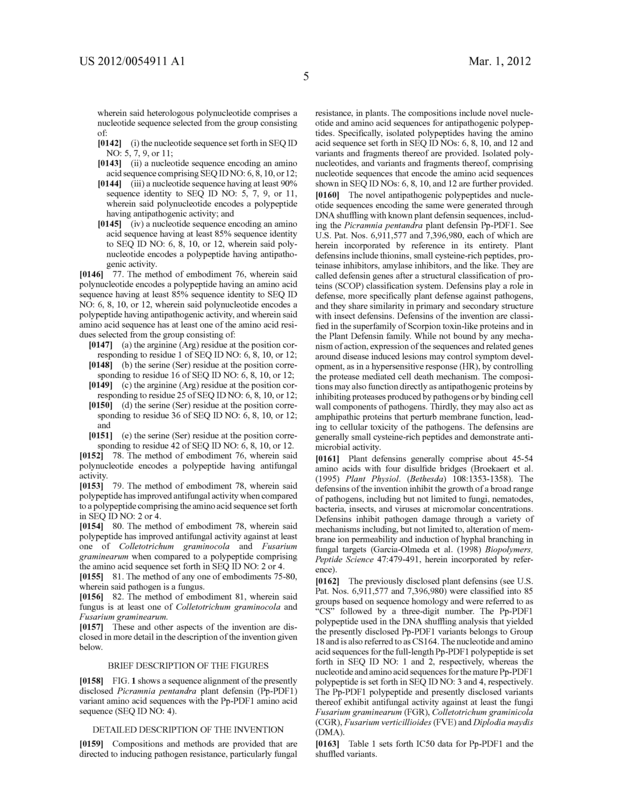 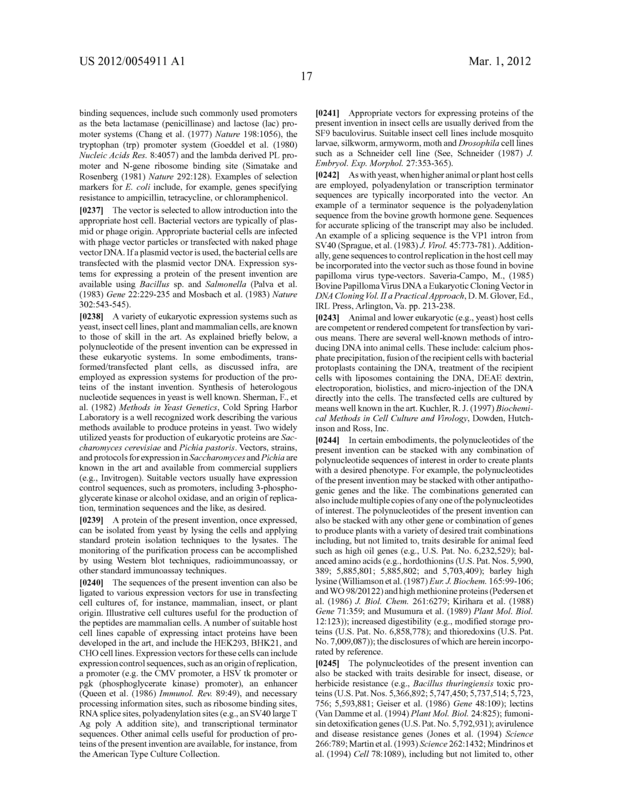 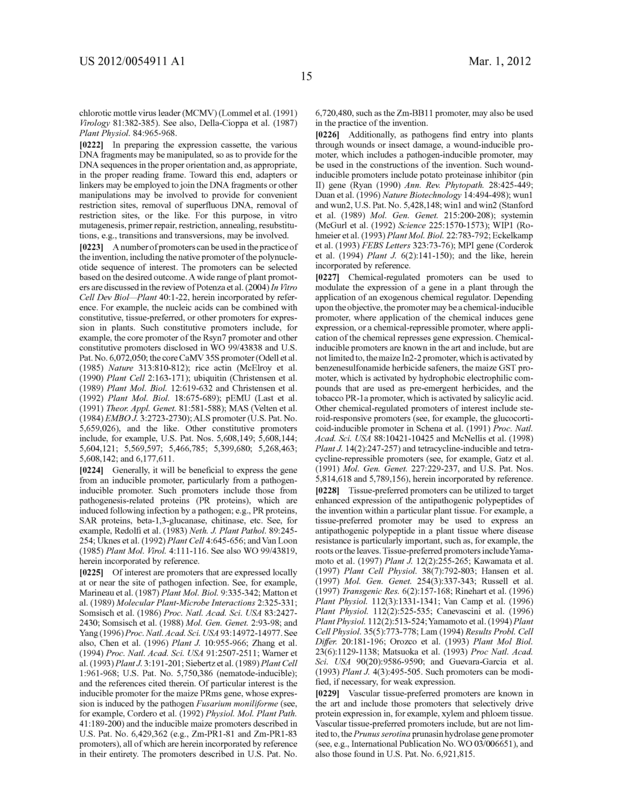 (e) the serine (Ser) residue at the position corresponding to residue 42 of SEQ ID NO: 6, 8, 10, or 12. 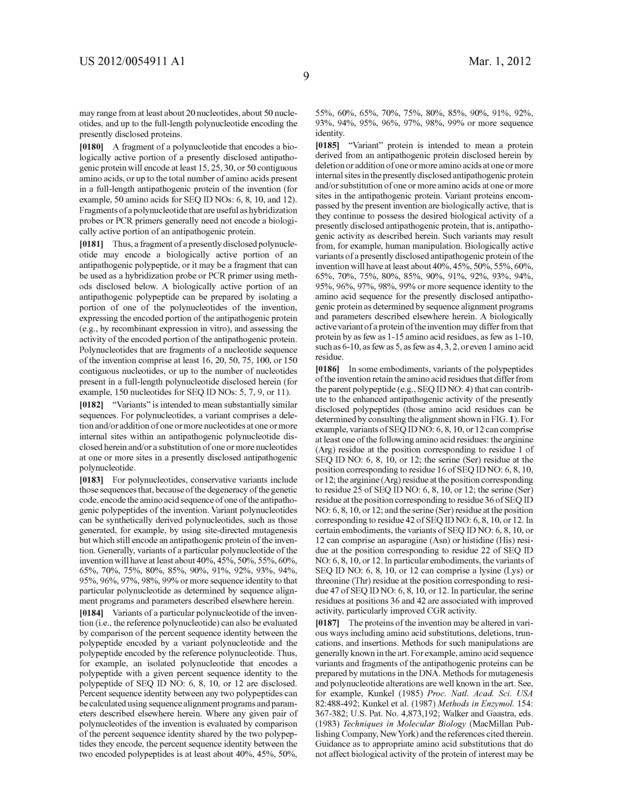 The isolated polynucleotide of claim 1, wherein said polynucleotide encodes a polypeptide having antifungal activity, wherein the antifungal activity is improved when compared to a polypeptide comprising the amino acid sequence set forth in SEQ ID NO: 2 or 4. 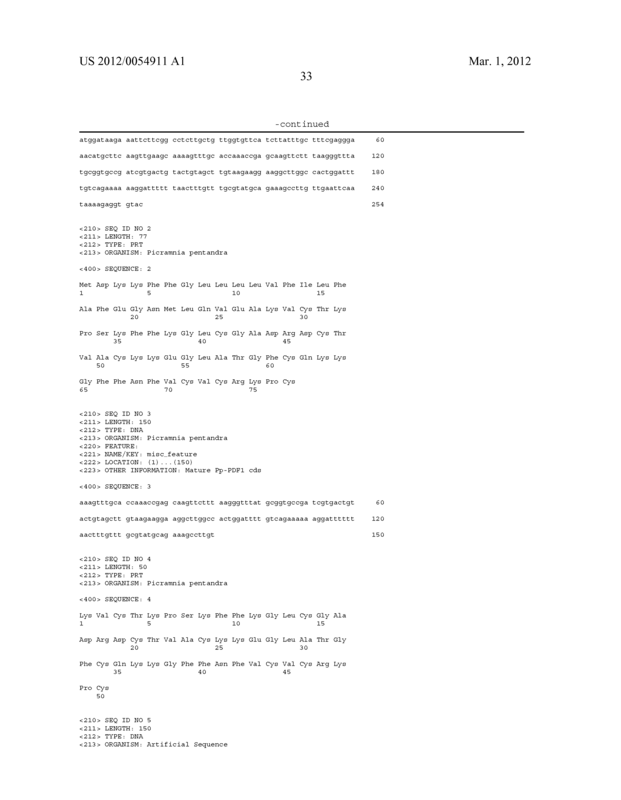 The isolated polynucleotide of claim 1, wherein said polynucleotide encodes a polypeptide having improved antifungal activity against at least one of Colletotrichum graminocola and Fusarium graminearum when compared to a polypeptide comprising the amino acid sequence set forth in SEQ ID NO: 2 or 4. 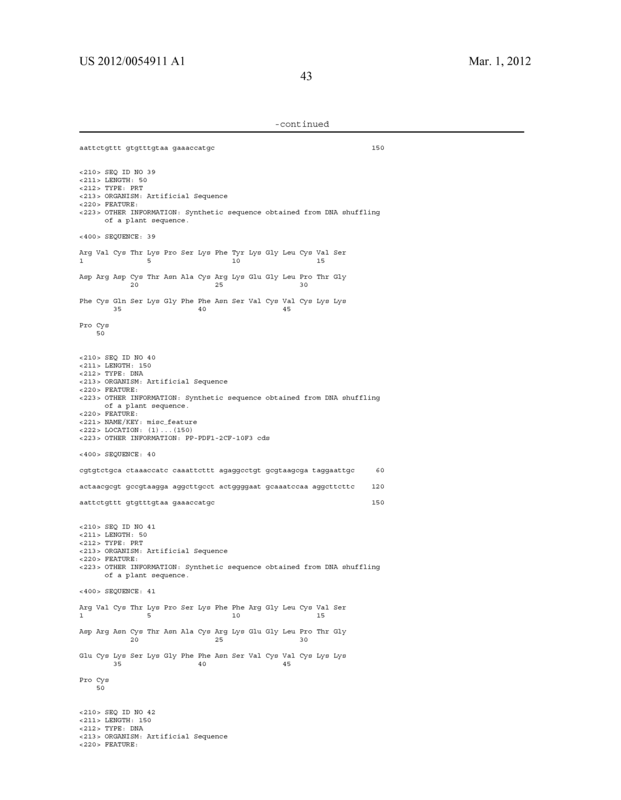 An expression cassette comprising the polynucleotide of claim 1. 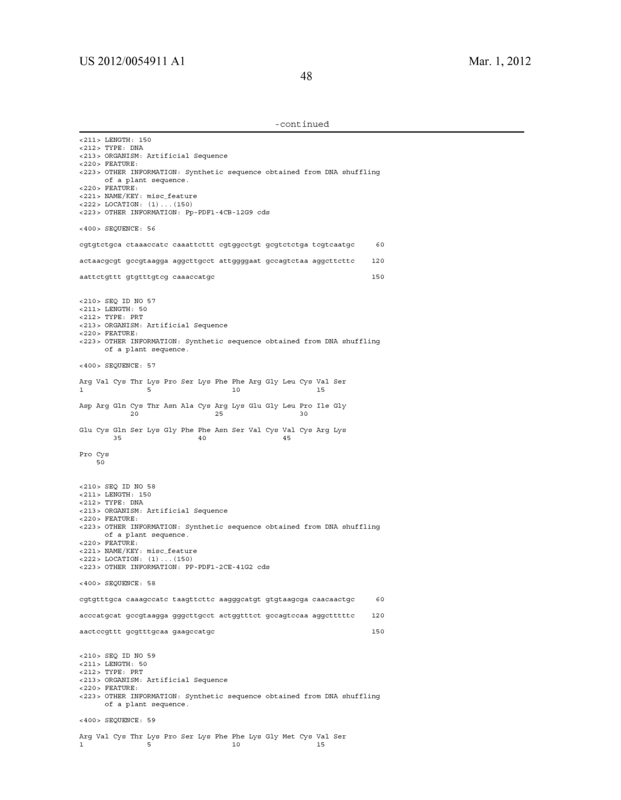 A host cell comprising the cassette of claim 5. 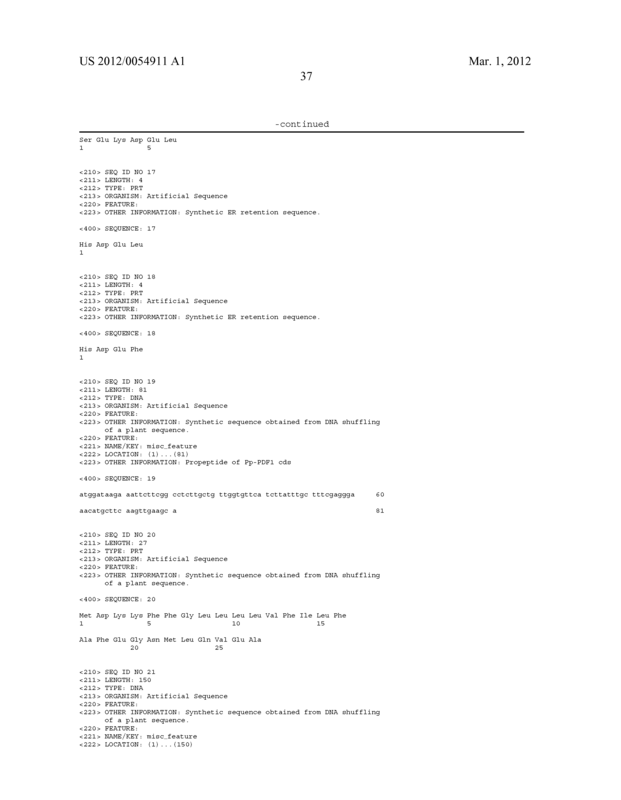 A microorganism comprising the expression cassette of claim 5. 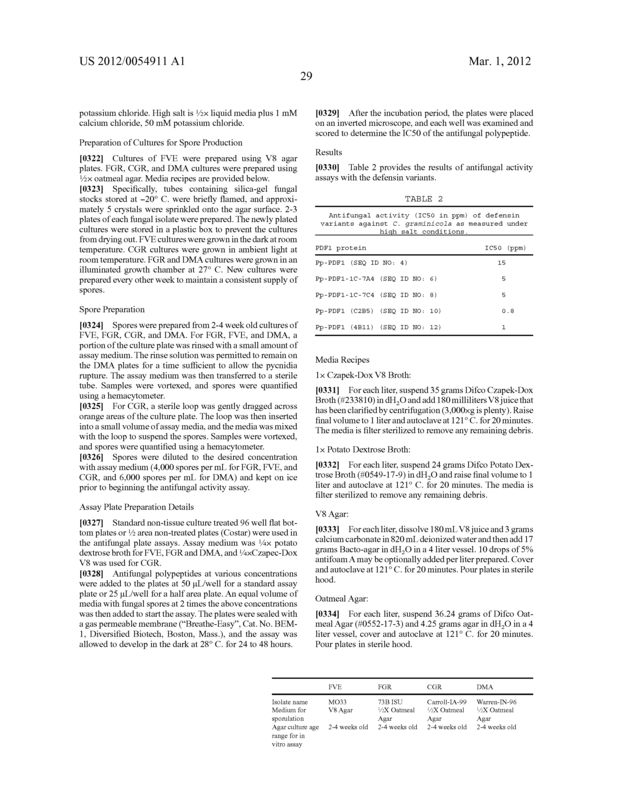 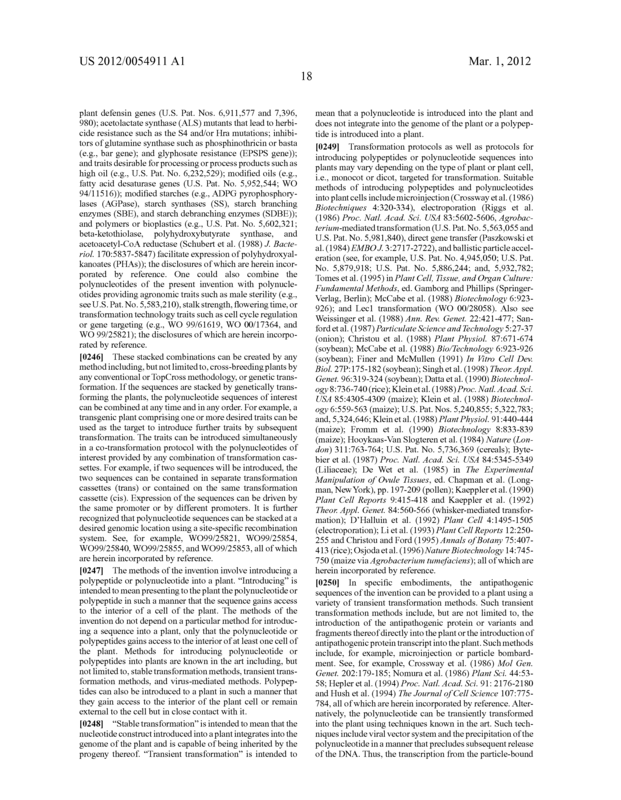 The plant of claim 8, wherein said polypeptide has improved antifungal activity when compared to a polypeptide comprising the amino acid sequence set forth in SEQ ID NO: 2 or 4. 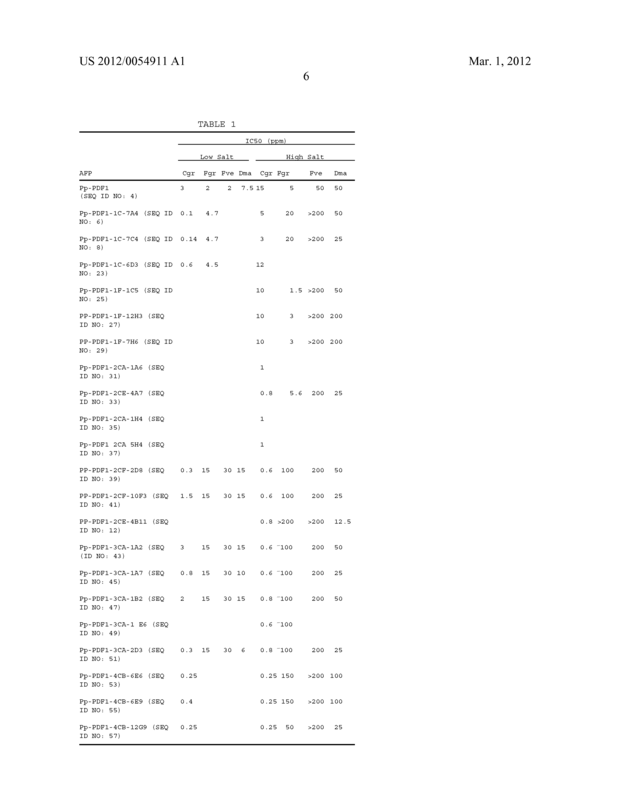 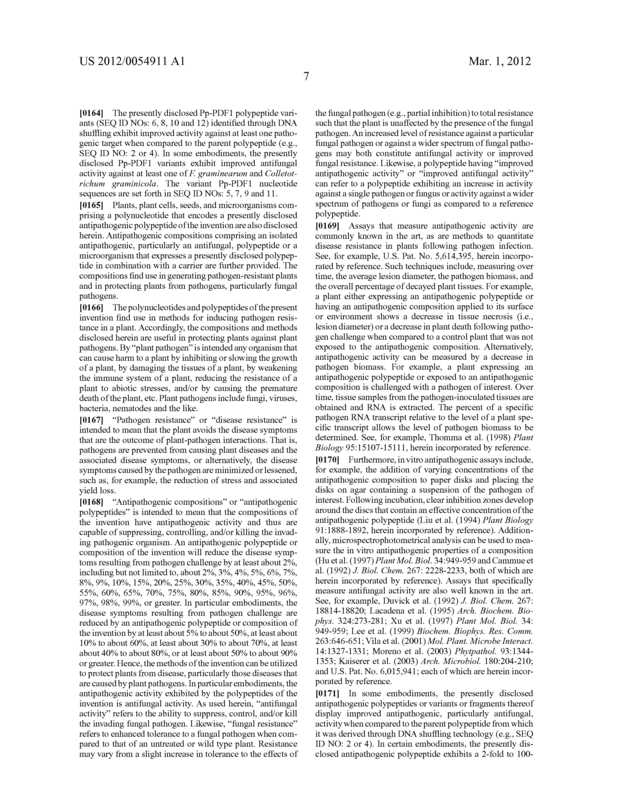 The plant of claim 8, wherein said polypeptide has improved antifungal activity against at least one of Colletotrichum graminocola and Fusarium graminearum when compared to a polypeptide comprising the amino acid sequence set forth in SEQ ID NO: 2 or 4. 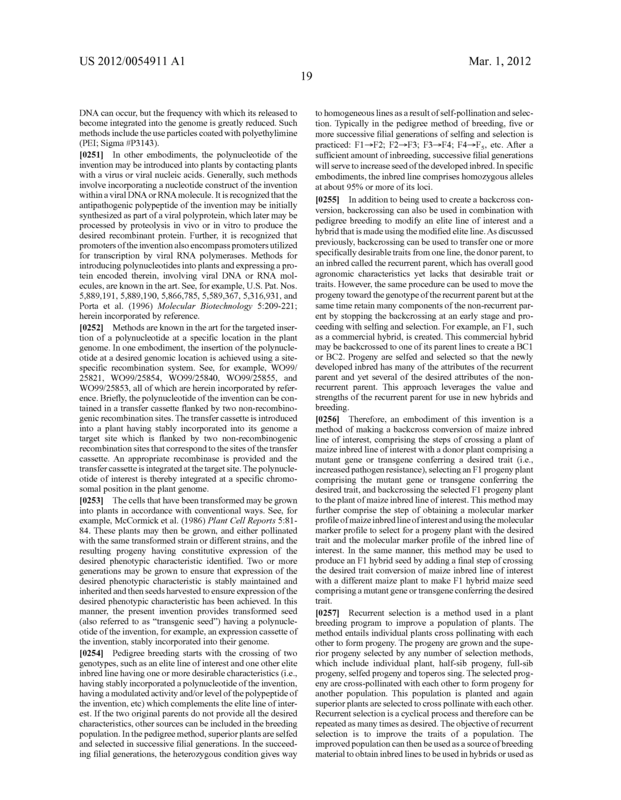 The plant of claim 8, wherein said plant is a plant part selected from the group consisting of a cell, a seed, and a grain. 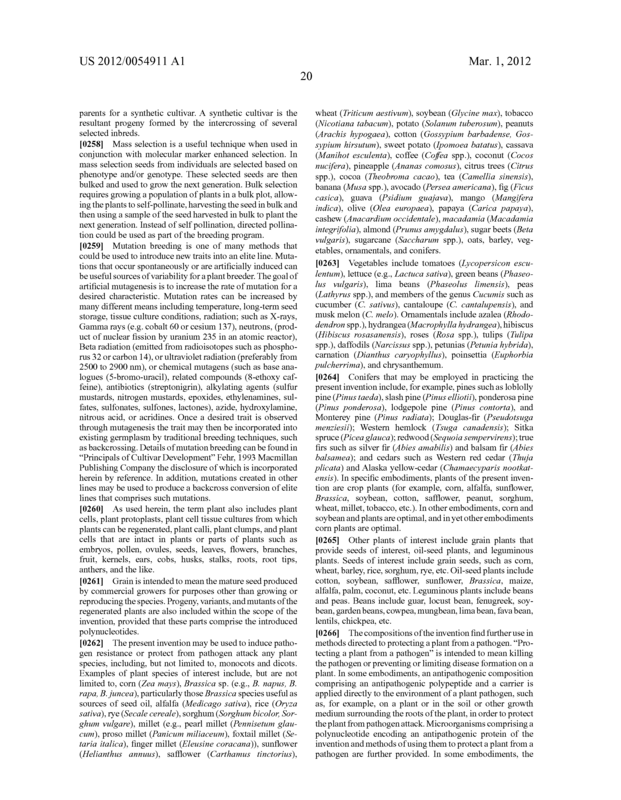 The plant of claim 8, wherein said plant is a monocot. 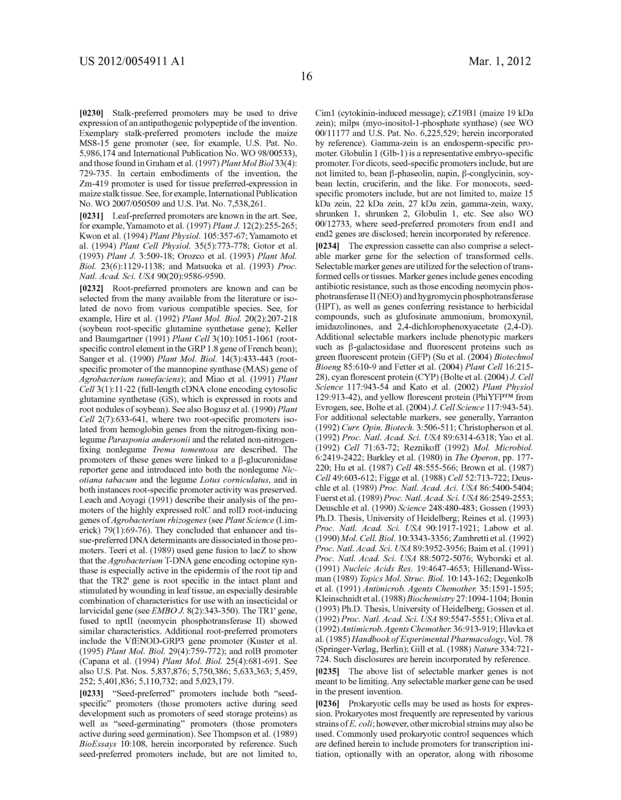 The plant of claim 8, wherein said plant is a dicot. 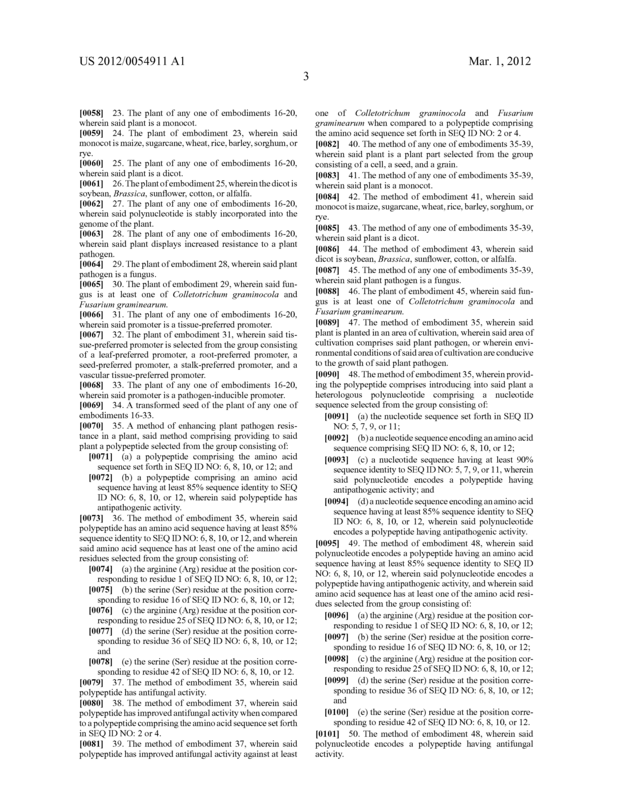 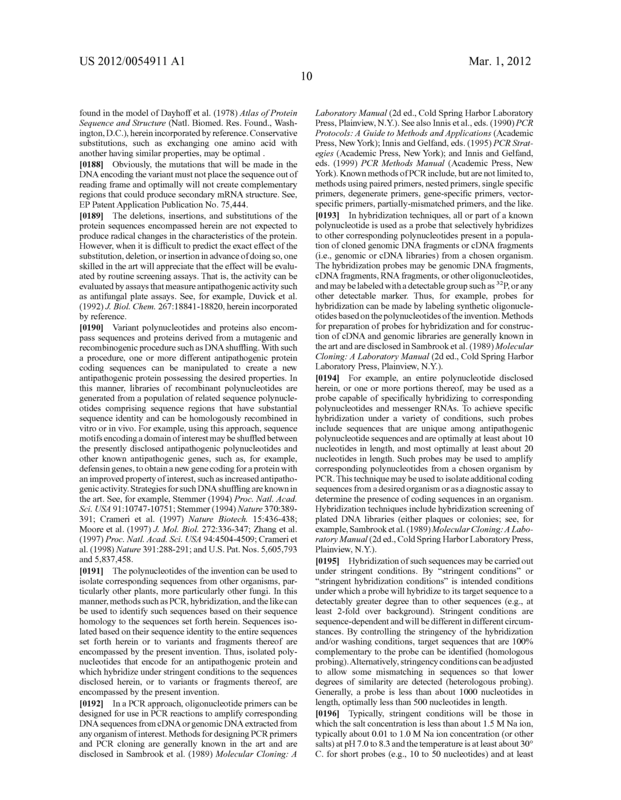 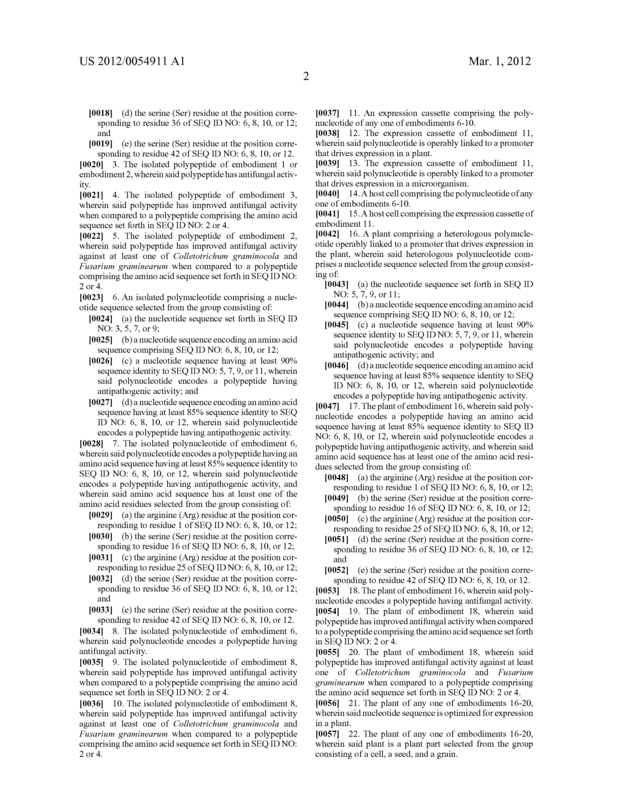 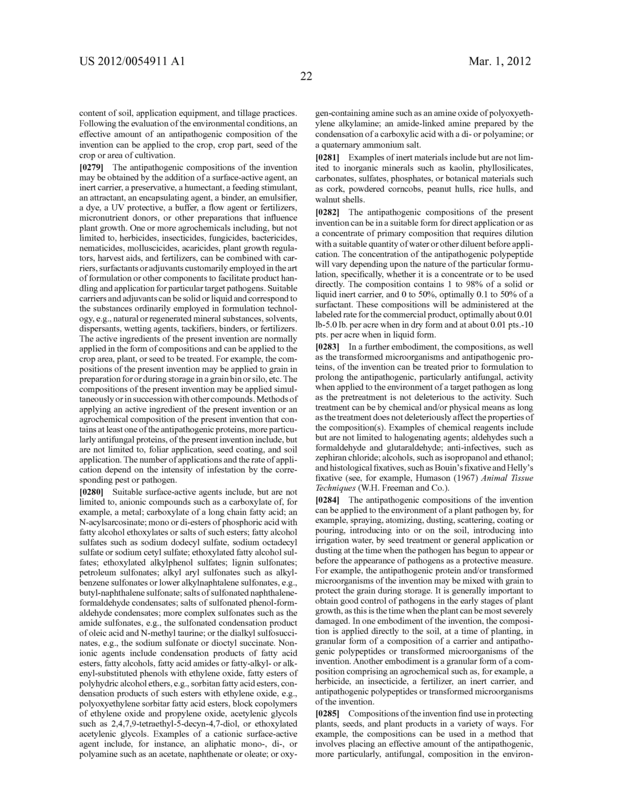 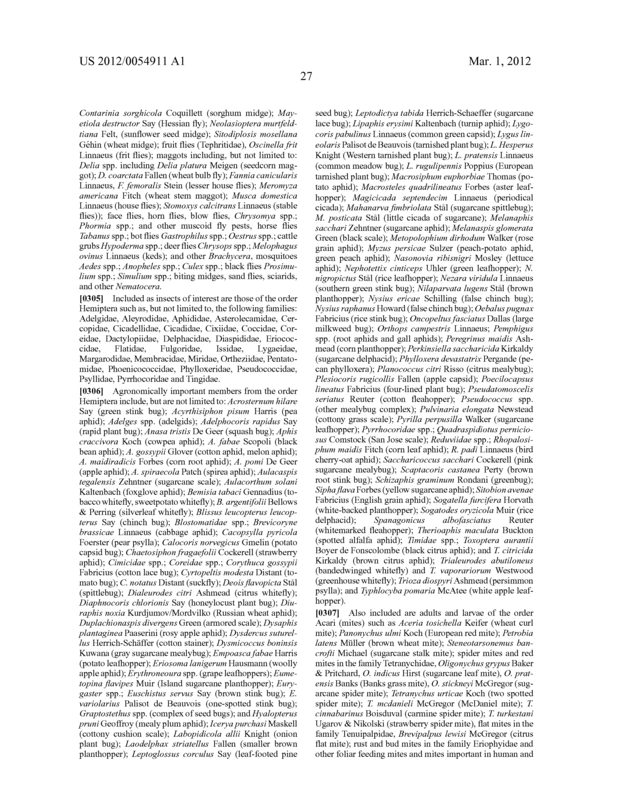 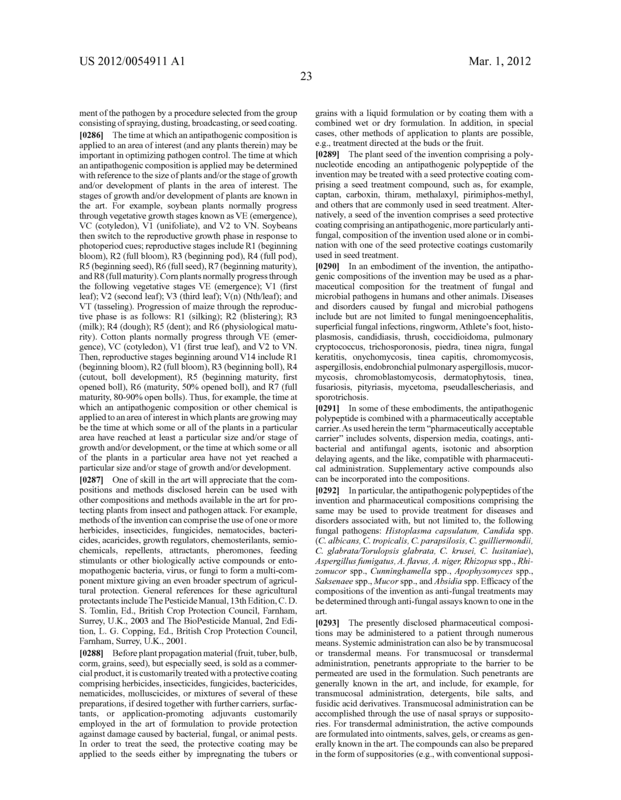 (b) a polypeptide comprising an amino acid sequence having at least 85% sequence identity to SEQ ID NO: 6, 8, 10, or 12, wherein said polypeptide has antipathogenic activity. 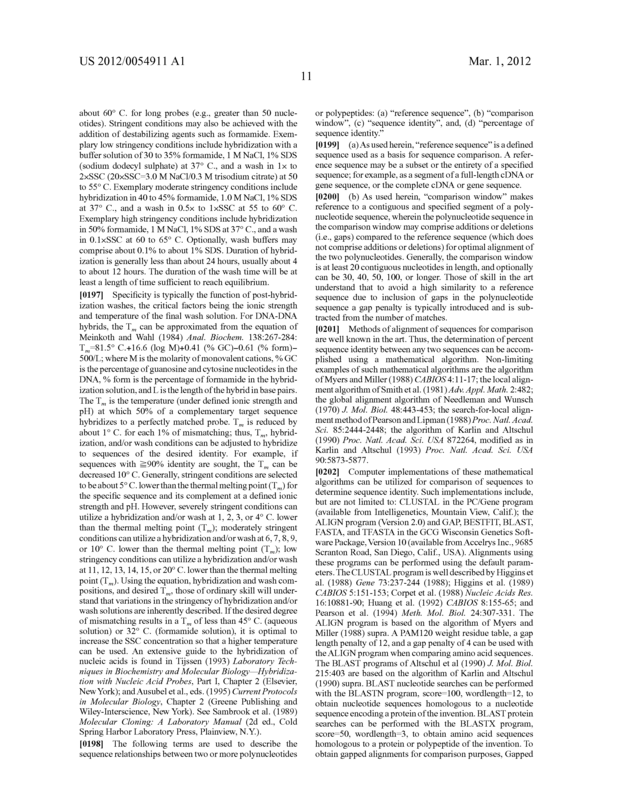 The method of claim 15, wherein said polynucleotide is stably integrated into the genome of the plant. 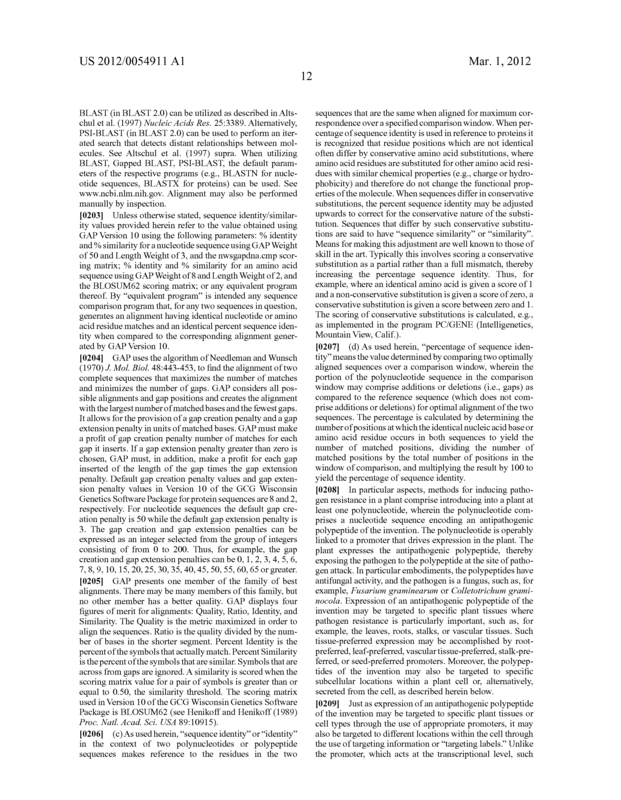 An antipathogenic composition comprising at least one polypeptide according to claim 2. 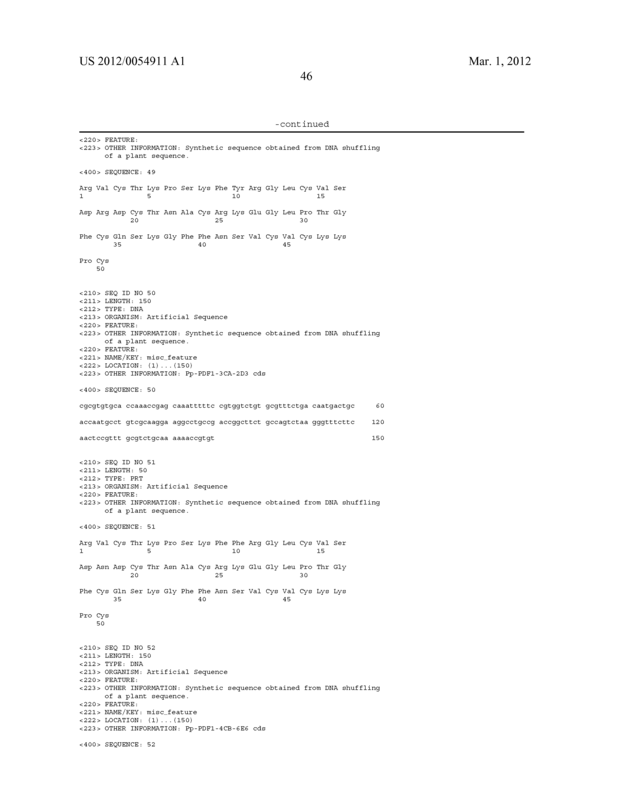 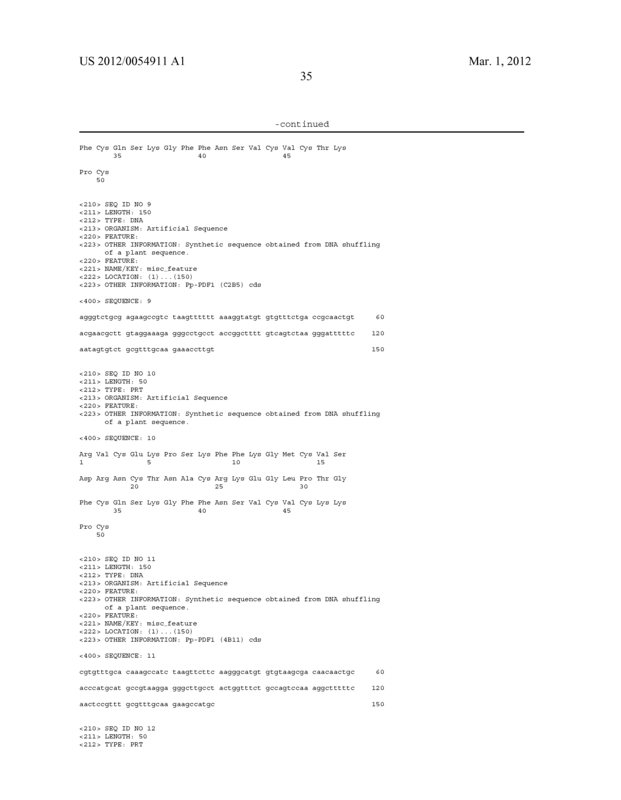 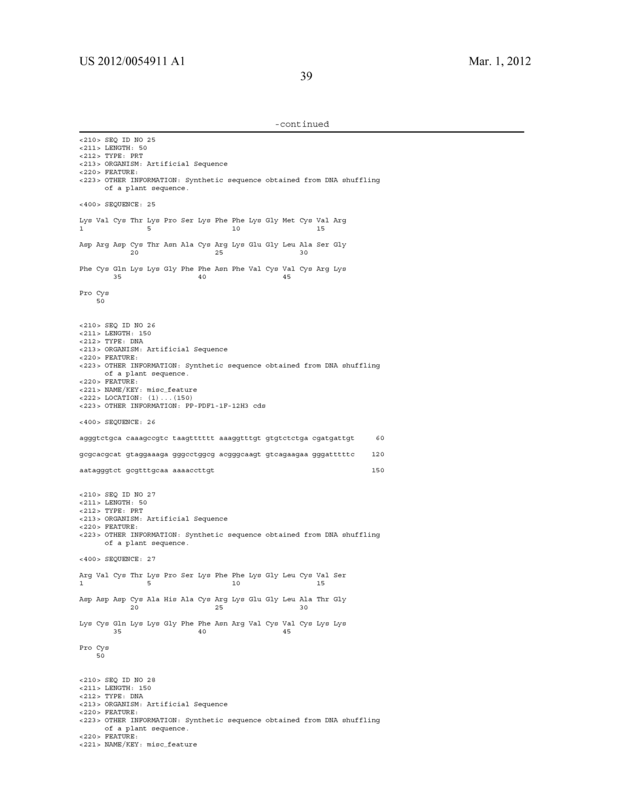 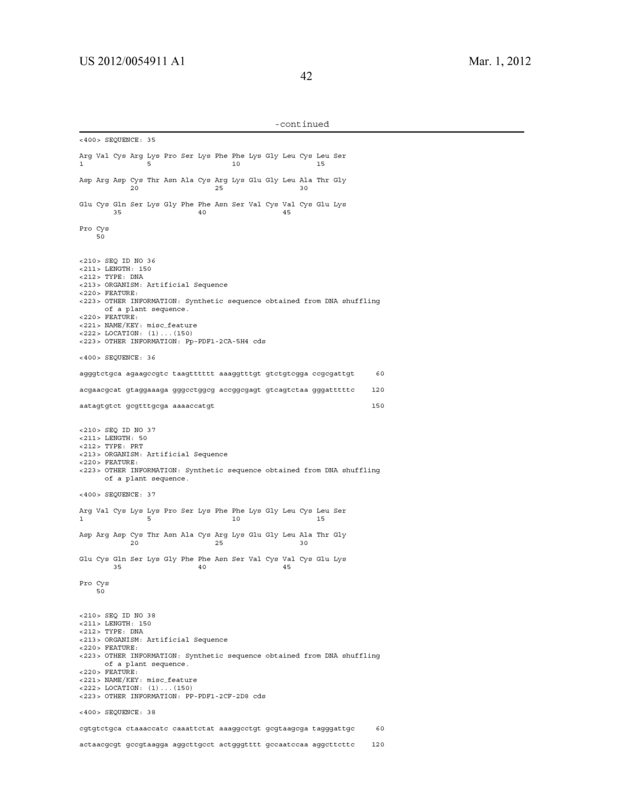 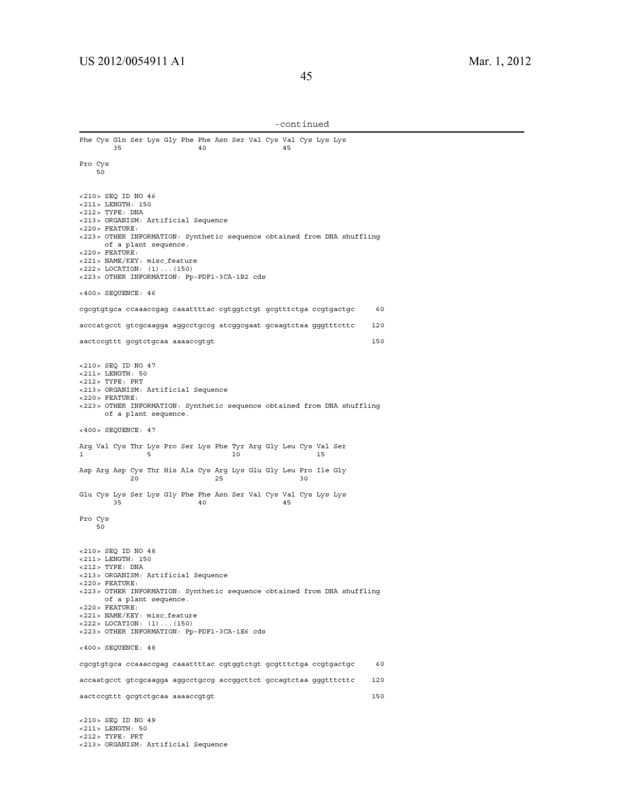 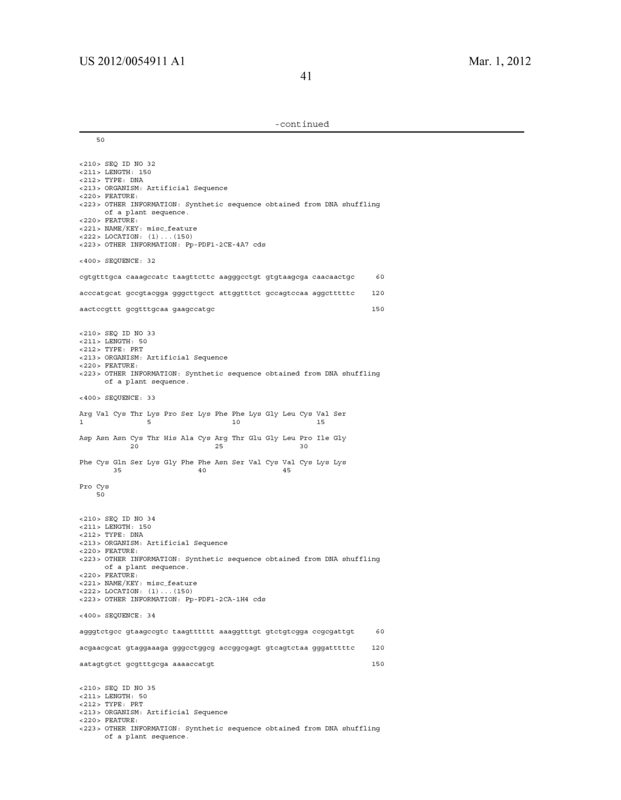 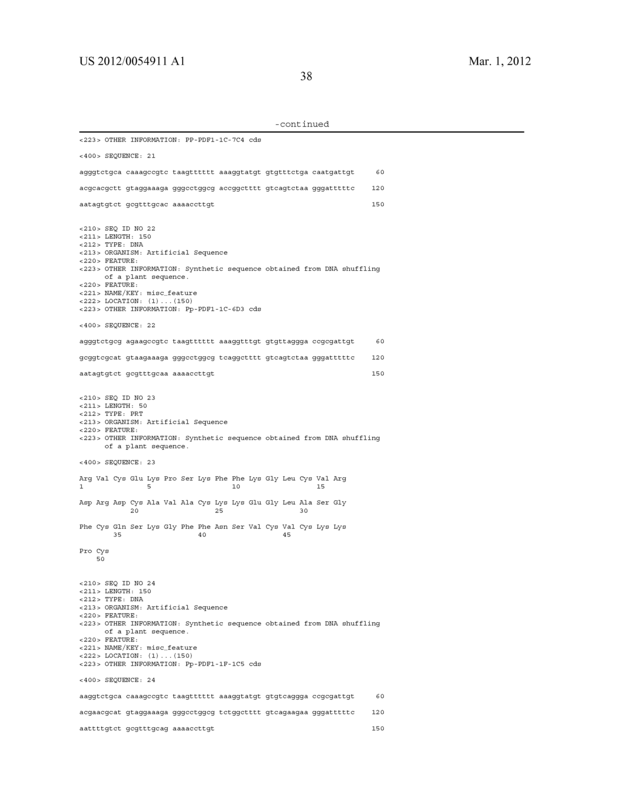 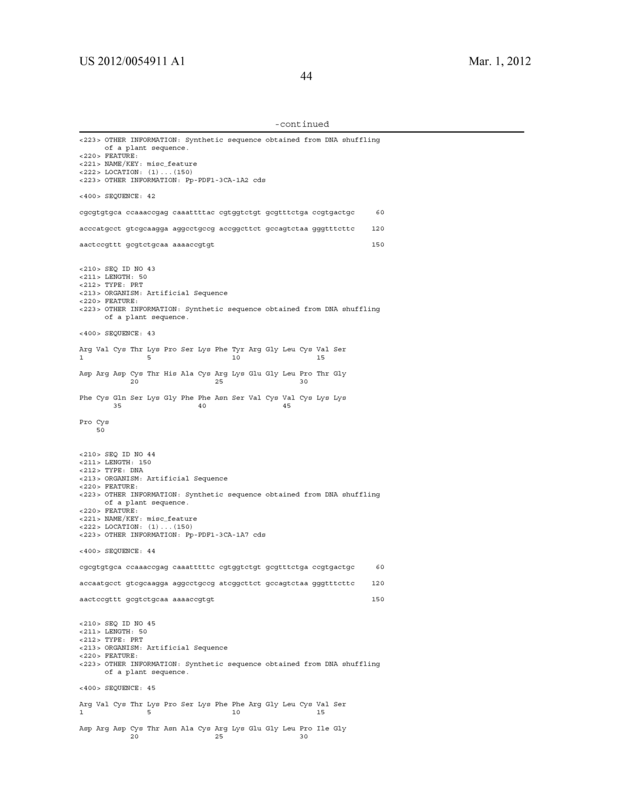 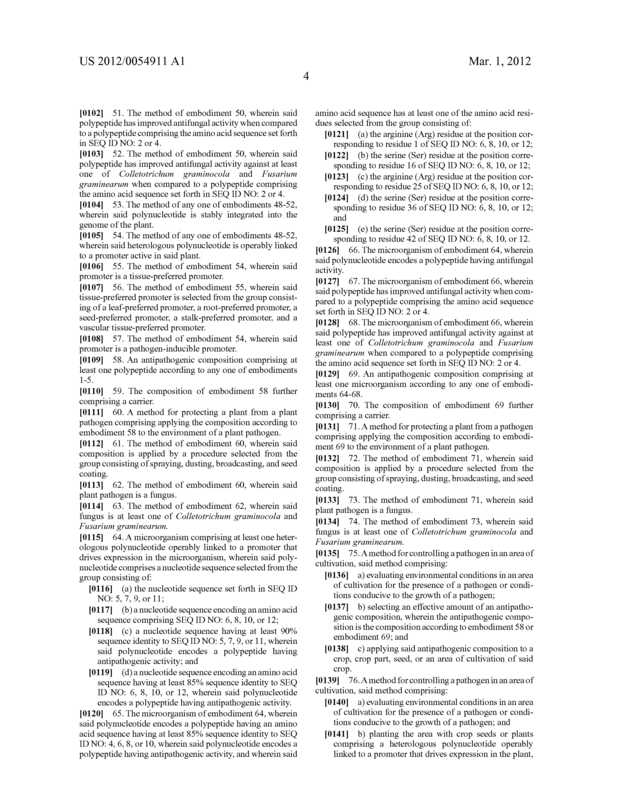 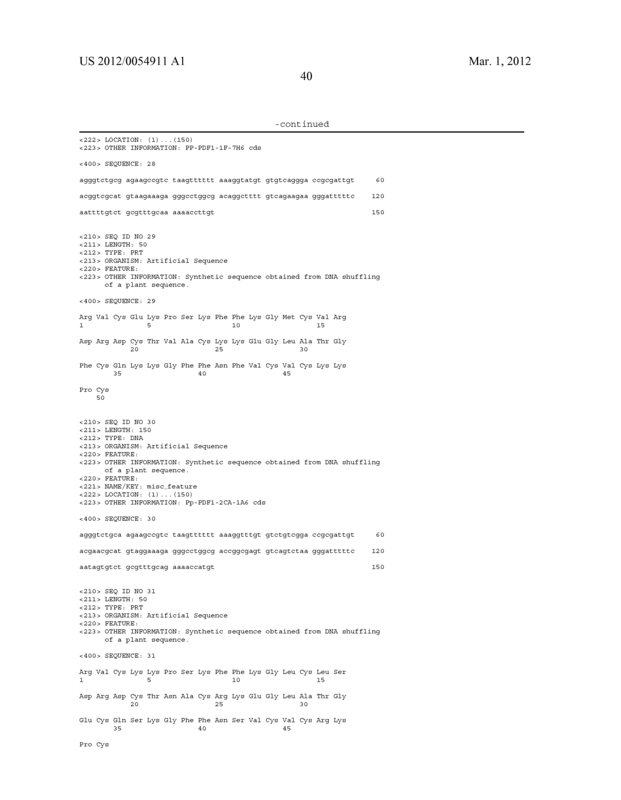 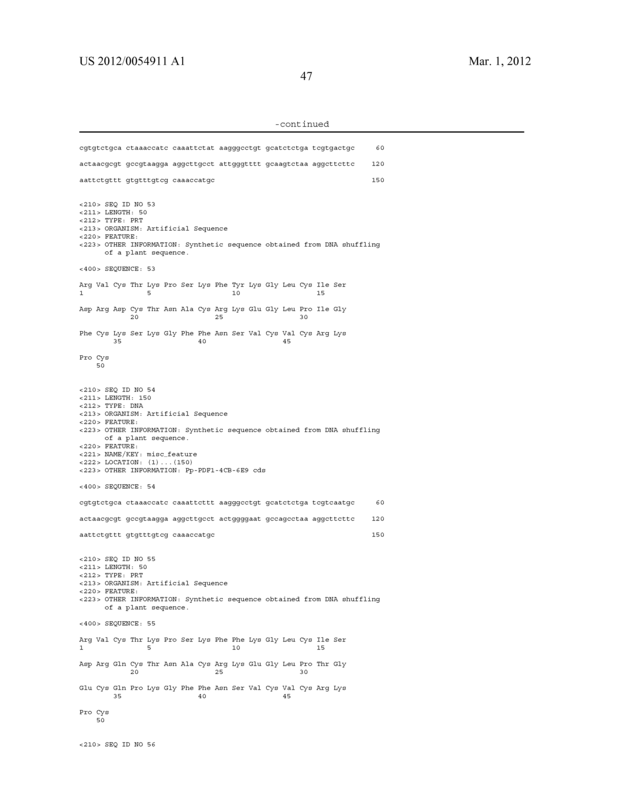 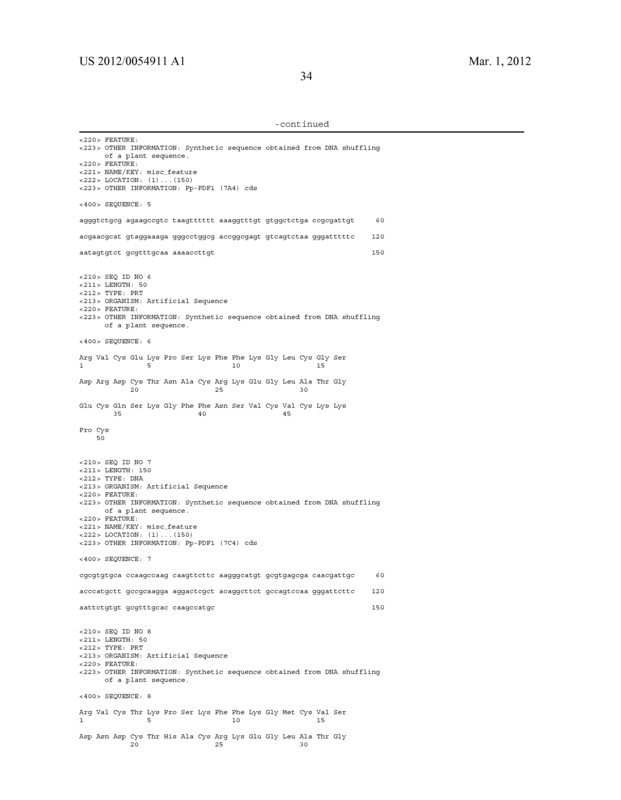 The composition of claim 18 further comprising a carrier. 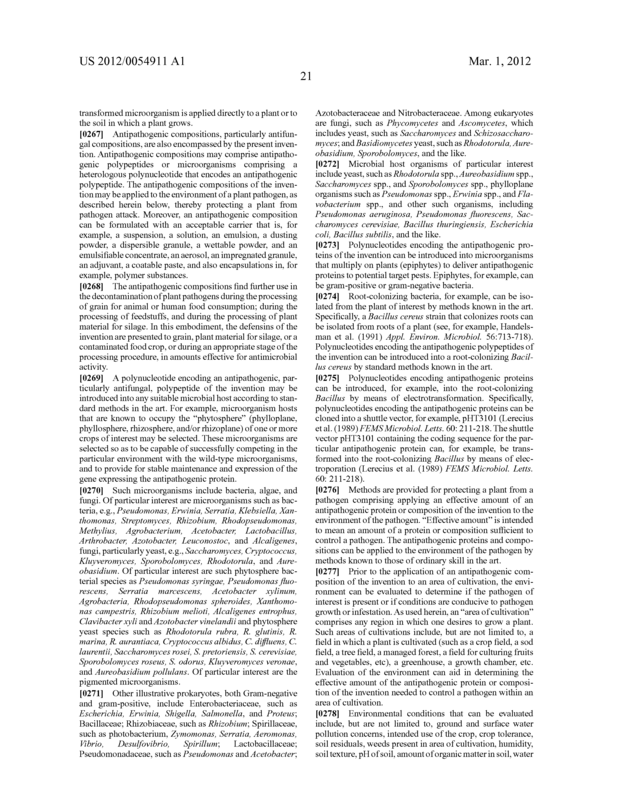 A method for protecting a plant from a pathogen comprising applying the composition according to claim 18 to the environment of a plant pathogen. 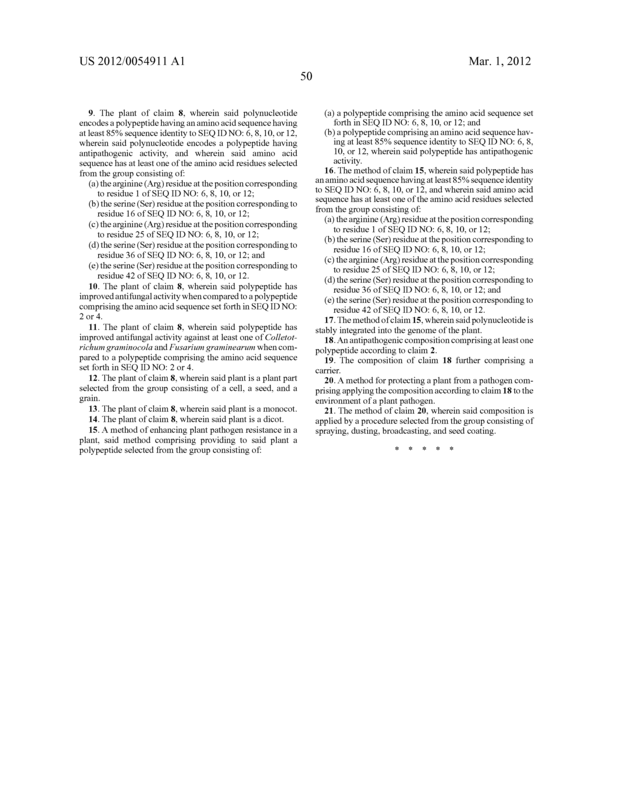 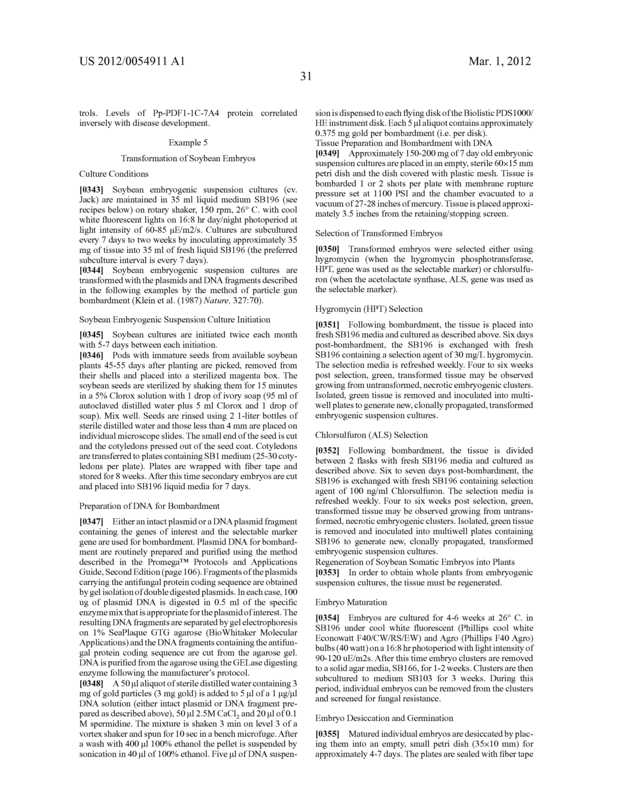 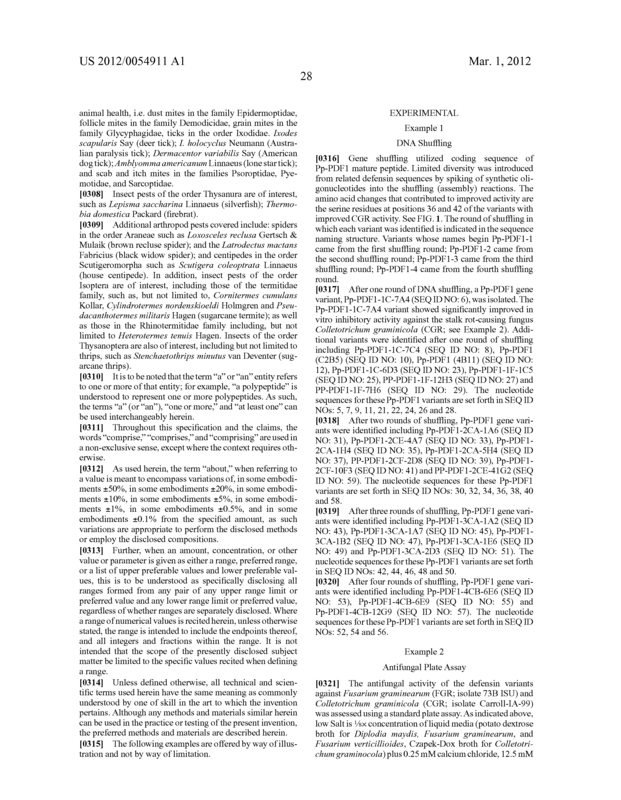 The method of claim 20, wherein said composition is applied by a procedure selected from the group consisting of spraying, dusting, broadcasting, and seed coating.